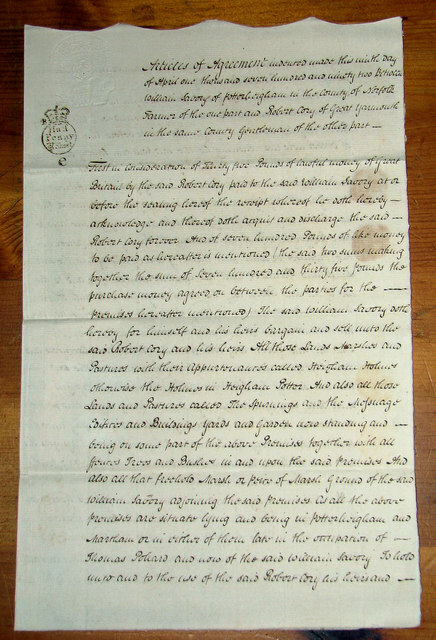 A legal agreement between William Savory and Robert Cory 9 April 1792. William Savory was John Savory's oldest son and heir and he continued the family's tradition to lease large parcels of the Lord Bishop of Norwich's land on Heigham Holmes > Link in the parish of Potter Heigham, which he in turn sub-leased to others. The lessee, Robert Cory, was a solicitor from Great Yarmouth who bought and sold properties. One of the witnesses to this transaction was Robert Cory junior > Link - an architect who in 1829 had built a suspension bridge over the River Bure near the ferry crossing in Great Yarmouth. Five years after his death, the bridge collapsed when a large crowd had gathered on it to see a clown in a barrel pulled by swans float under the bridge. 79 people died in the tragedy, 59 of whom were children aged between 5 and 13. Few could afford a proper burial and were buried in two mass graves. A memorial inscribed with all the victims' names was erected near the spot.